We find that the most successful implementation of talent management software occurs when the client thinks about the longer term and the bigger picture from the get-go. To help you as you look for the right supplier, we've pulled together the essential questions you need answering when searching for a cloud-based talent management software solution. 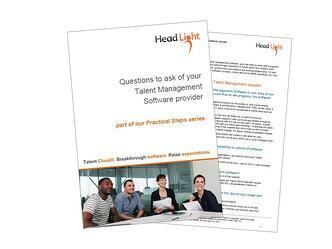 When you're in the market to upgrade or update your talent management software, ask those you are thinking about working with these questions - and see what they have to say! You may have fallen foul in the past to limited availability or uptime of Talent Management software. What should you be looking for in this area? How does it comply with forthcoming GDPR regulations? How can you be reassured that the software will keep pace with your talent management needs - and how often is there a new release? How canyou customise the software to meet your very specific work flow, competency framework or language needs? Can you outsource the management of the system so you can focus on the value-add activities of making sense of and using the information generated? And when you do have problems, how are you supported? Security may be a real concern for you. What safeguards does the supplier have? How can you influence product development? There are of course many more questions, and you can review thes in one of our Practical Tools documents which you can request below. Why not keep in touch with us by registering to receive our regular updates.